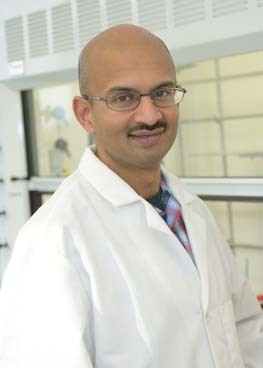 Samarjit Patnaik joined NIH in early 2009 and now works at NCATS on a chemistry team led by Juan J. Marugan, Ph.D. Patnaik focuses primarily on developing drug-like small molecule probes, mostly derived from high-throughput screening hits, to interrogate novel targets and pathways in cellular and animal disease models with a focus on rare and neglected diseases. He also devises chemical tools that facilitate target deconvolution from phenotypic assays. His work has led to the out-licensing of a class of noninhibitory chaperones for glucocerbrosidase as a prospective therapy for Gaucher disease and the initiation of a collaboration with the National Cancer Institute’s Experimental Therapeutics program for the pre-clinical development of perinucleolar compartment inhibitors as agents against cancer metastasis. Before joining NCATS, Patnaik worked in the Oncology Medicinal Chemistry Division at GlaxoSmithKline, where his team developed the pre-clinical candidate GSK1838705A as a dual insulin growth factor-1 receptor/anaplastic lymphoma kinase inhibitor. Patnaik received his B.Sc. in chemistry from St. Stephen’s College in Delhi, India, and a B.A. in natural sciences from Cambridge University. He received a Ph.D. in organic chemistry at Indiana University. Metarrestin, a perinucleolar compartment inhibitor, effectively suppresses metastasis. Inhibition of PIP4Kγ ameliorates the pathological effects of mutant huntingtin protein. Identification of 4-phenylquinolin-2(1H)-one as a specific allosteric inhibitor of Akt. Gastric Acid Secretion from Parietal Cells Is Mediated by a Ca(2+) Efflux Channel in the Tubulovesicle.